New York - Russian teen Andrey Rublev, inspired by other young stars of Russian parentage, is the youngest US Open quarter-finalist since Andy Roddick in 2001 and on a collision course with his idol - Rafael Nadal. The 53rd-ranked 19-year-old dispatched Belgian ninth seed David Goffin 7-5, 7-6 (7/5), 6-3 on Monday to book a last-eight date on Wednesday with 15-time Grand Slam champion and world No 1 Nadal. "I'm just going to try to enjoy," Rublev said. "This is going to be good challenge for me to see how far I am from the top players and how much more I need to work. "He has amazing legs. He has amazing defense. And me, I have good shots. I can play really fast, in fast rhythm." Rublev will try to become the youngest Grand Slam semi-finalist since Nadal at the 2005 French Open and the US Open's youngest since Australian Lleyton Hewitt in 2000. "I think normal, like always. It's a quarter-final. But in general is just a match," Rublev said. "I hope it's not my last quarter-final on the ATP Tour. I have to try to don't show emotions, to try to be focused, to try to fight." 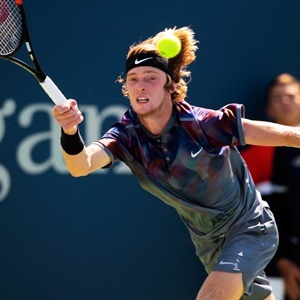 Rublev's run caps an impressive season by rising stars like Canadian teen Denis Shapovalov, into the US Open last 16, and German fourth seed Alexander Zverev, a five-time winner this year - both born to Russian parents in other nations. "I think it's quite good that they are genetically Russian guys, even they are different nationality," Rublev said. "Their winning is quite good - for Russians." It also bolsters Rublev's confidence as he prepares to test how deep he can go in a Grand Slam event. "Is great because we are giving each other motivation. When you see young guys winning big matches, I start to think, 'If he can win, maybe I also can win it. Why not?'" Rublev said. "All these guys, they have a good level. You can see all the guys, Shapovalov, Zverev, (Borna) Coric, they are beating all the players. They also have level to be in quarters, in semi-finals. Today I'm here, but next tournament they can easily win it or to be in the finals." Rublev says he is not intimidated by facing someone with the success of Nadal or Roger Federer, a possible semi-final foe. "I'm thinking more like it's amazing what they are doing. When I see this, I feel that they're really legends," Rublev said. Rublev turned to tennis after liking the game his mother coached more than football or boxing, which his dad coached. "I was always on tennis court. My dad was boxer, so I also was in a boxing gym always. I don't like it. When I was there, I wanted to leave. When I was on tennis court, I like it so much," Rublev said. "Also I like football. But I start to think if I'm going to try to play football, it means I'm going to have less tennis. I was not ready to have less tennis. I say to myself that I want to play tennis all days, and I cannot be without tennis." Rublev wanted a solo sport more than being part of a team. "I think it's something more special, different feelings than compared to the team sports," he said. "I like this feeling more."